Ford says it has taken out or applied for about 100 patents on the 2015 F-150. Editor's note: This story has been updated to clarify how the key fob operates the tailgate. 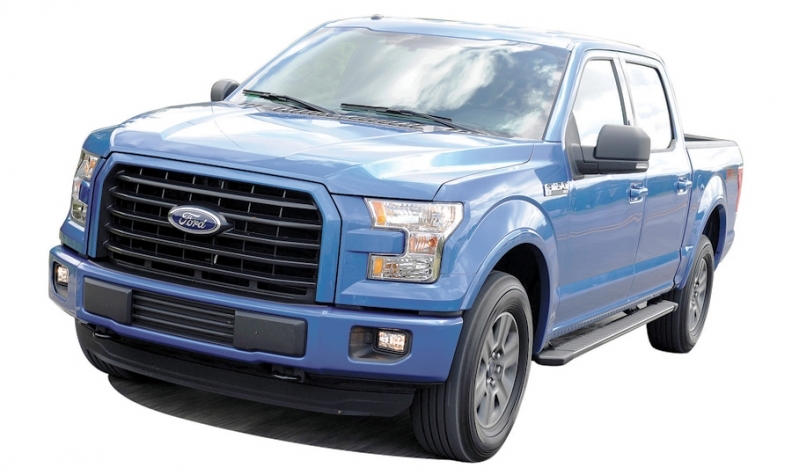 SAN ANTONIO -- Ford Motor Co. is bringing technology into the 2015 F-150 pickup more commonly associated with luxury cars. The list of new features is so long, it might seem bewildering to customers. Ford says it has taken out or applied for about 100 patents on the redesigned truck. Under former CEO Alan Mulally, Ford tried to stake a claim as a technology leader. The F-150 is the latest expression of that effort. "We bit off a lot of technology," said Pete Reyes, F-150 chief program engineer in an interview at the media launch here. "At one point, I thought it was more than we could chew." But Reyes says he is happy with the final result. With all the new features, Ford reduced its trim levels from 10 to five -- XL, XLT, Lariat, Platinum and King Ranch -- to simplify packages for customers and dealers. Pete Reyes, F-150 chief program engineer: "You can tie more stuff down" in the bed. 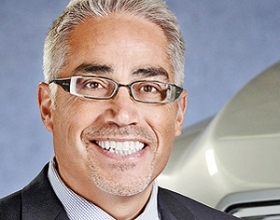 Here are a few of the key features that Ford dealership sales consultants will be learning in intensive training sessions to prepare for the arrival of production vehicles in December. 2.7-liter EcoBoost engine: The 2.7-liter is the latest in Ford's EcoBoost family of turbocharged, direct-injection gasoline engines. It offers stop-start for the first time in a pickup. And it is Ford's first use of a compacted graphite iron cylinder block in a gasoline engine, the same material Ford uses in its 6.7-liter PowerStroke diesel. The engine's cylinder heads have cast-in, or integrated, exhaust manifolds to reduce turbo lag and cut weight. Variable valve timing boosts torque. On Texas Hill Country roads near here, the pickup felt quick and responsive. The 2.7-liter EcoBoost, which cranks out 325 hp and 375 pounds-feet of torque, is priced $795 above the base 3.5-liter V-6, but Ford is offering a $300 spiff during the launch, bringing the premium down to $495. Ford says the 2.7-liter engine gives the F-150 a payload rating of 2,250 pounds and that the F-150 can tow a maximum of 8,500 pounds. The Ford Edge Sport, coming in 2015, will be the second vehicle to get the 2.7-liter EcoBoost. 360-degree camera system: Pictures from four different cameras are stitched together to create a bird's-eye view of the truck on the navigation screen, helping drivers to maneuver into tight parking spots and navigate narrow streets. Ford also offers a trailer hitch assist that helps drivers line up a truck and trailer without a spotter. Other driver-assist features include adaptive cruise control; blind-spot detection; cross traffic alert, which alerts drivers backing out of a parking space to traffic; and active park assist. These are all features offered on Ford cars, but never on the F-150. BoxLink cargo system: Metal brackets and interchangeable cleats help secure accessories and cargo to the bed. Among the accessories that can be bolted onto the insides of the bed: dividers, storage bins and cargo ramps for loading motorcycles, lawn mowers or ATVs. "You can tie more stuff down," says Reyes. LED spotlights: No longer will owners have to hold a flashlight in their mouths while they work around their trucks at night. Ford is offering spotlights on each sideview mirror and one on the tailgate. MyView customizable screen: The 8-inch screen sits in the center of the instrument cluster. With the click of a button, drivers can organize their favorite gauges to suit their preferences, whether it's tire pressure, trailer information, off-road mode or trip fuel. LED headlamps: Available LED headlamps will last five times longer than conventional bulbs, Ford says. Ford lighting engineers framed the headlamp with an LED tube that makes the truck easy to spot at night. Remote tailgate: Owners can lower the tailgate using the key fob. There's also a new cargo step built into the tailgate that can be pulled out and lowered. It's wide enough to accommodate full-size boots.